Please, please set some time aside and feast your ideas on Natalie Coleman’s new autumn/ winter collection. What a sight of dazzling sequins, soft gentle pastels and hazy, sleepy greys. There is something for everyone s complexion and taste. 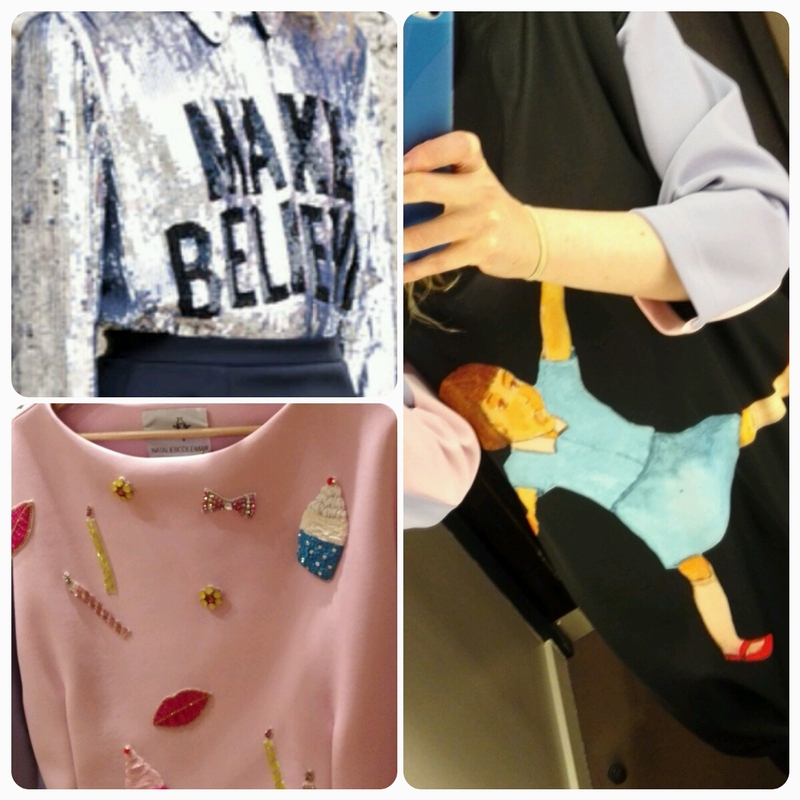 Above: Silver ‘Make Believe’ shirt (sequins), pink & blue ‘Birthday Wish’ top (neoprene) & printed knee-length dress(neoprene & jersey). As mentioned by other bloggers, her designs reflect that of a somewhat quirky and playful nature, frequently emphasising the youthful, romantic girl in all of us. To be found beyond these layers is a hint of feminine delicacy, reflected in her soft textures. 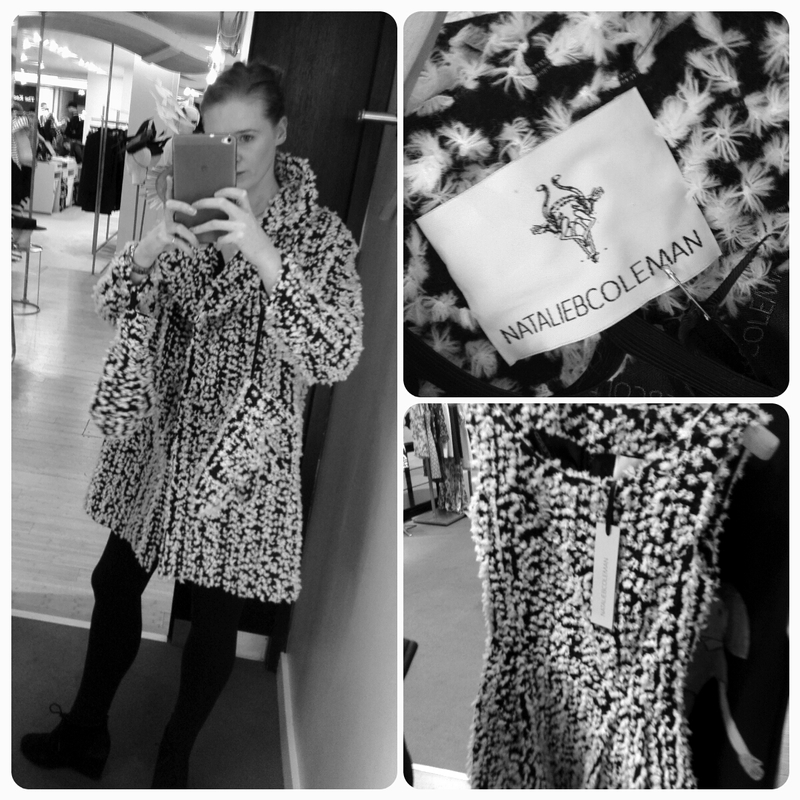 My favourite piece, on trying just about all today in Brown Thomas was by far this beautiful above knee length coat. My obsession in fashion has got to be hands down; a good coat. You’re always dressed with a good coat, I was made to believe ( wise words of mother)! Needless to say I ran to the corner of Natalie’s railing and immediately slipped into the beautiful black & white ‘snow’ swing coat. Above: Fiona wears her favourite black & white swing coat. The pièce de résistance has got to be the cute pair of mittens attached within to keep those paws warm in the winter! Natalie’s coat is a very reasonable price considering the workmanship and attention to detail. Why not go the whole hog and splash out on the fitted, cocktail ‘snow’ dress to match. Natalie B Coleman, Irish designer has had her creations worn by celebrities including Mary J Blige, but closer to home Kathryn Thomas and The Corrs. Natalie’s fabulous collection is on display in Brown Thomas (second floor), Grafton Street, Dublin 2 as part of ‘Create 2015’- a showcase of extraordinary design talent and innovation for a limited time only. Brown: Now it’s your turn.